Thirty years ago, I became an aunt to my first-born nephew, Ryan. The little bundle of baby-boy joy was born on my birthday, and the fact that he was not a girl didn’t prevent me from hoping his parents would name him Deborah in my honor. They saw things differently. When I recently found out that Ryan was soon to be a dad himself, also to a baby boy, I asked if he might consider naming his little guy Deborah. No luck again! Bummer! 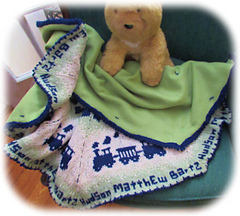 Still, in honor of the impending birth of my grand-nephew Hudson Matthew Bartz, I designed this choo-choo blanket full of hearts and love. 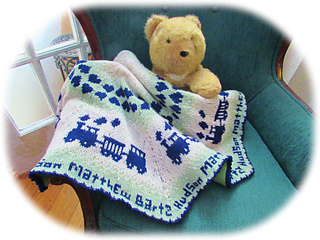 The pattern includes all uppercase and lowercase letters, and a grid, so you can place your own baby’s name (think Deborah!) in the name spaces in the pattern. 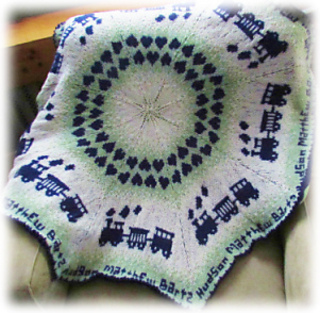 Or knit additional hearts in lieu of baby’s name. 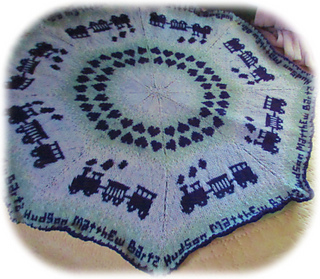 The blanket is knit in-the-round, and in order to keep little toes and fingers from getting caught in the color change floats, the blanket is backed with soft, fluffy fleece. Use the colors I chose, or choo-choose your own!